Hyacinth spring flowering-perennials. They are only visible during spring, you might probably enjoy an environment with flowering hyacinth every spring. In this method you'll be needing scissors and glue. This tutorial is not below to origami since cutting method is presence. Constructions paper - You can buy in amazon or ebay for bulk and very cheap. try this bulk of construction paper 20 origami paper 210 sheets for $5. You can use any paper of your choice though. 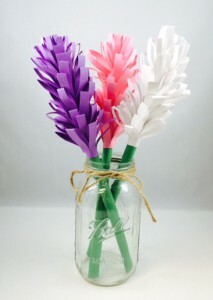 Note: The typical hyacinth flower colors are purple, pink and white. * cute your pieces of paper into four strips (short side) then take it strip and fold in half (long side), cut slices from the edge, leaving about centimeter of spare (depending of your prefer space) until the other end. You can make thinner strips or larger strips. See image below. 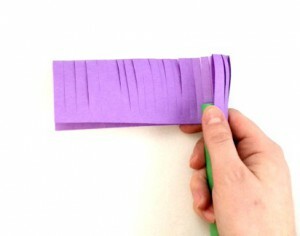 Cut 1 inch thick strips of green construction paper (lengthwise) then roll each strip up into a tube, then glue into place. Set aside and wait to dry. 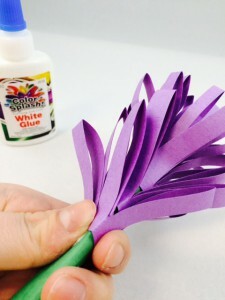 Starting from the top of the stem, glue an end of a flower strip into place and continue to roll and glue another strips around, until you reach the end strip. Repeat with the next three strips. See image below. And your finished product is a beautiful hyacinth bouquet. You make make more flowers to make your work more amazing.